We’ve been singing Slippery Fish a lot in our house lately (that, and What Does the Fox Say? 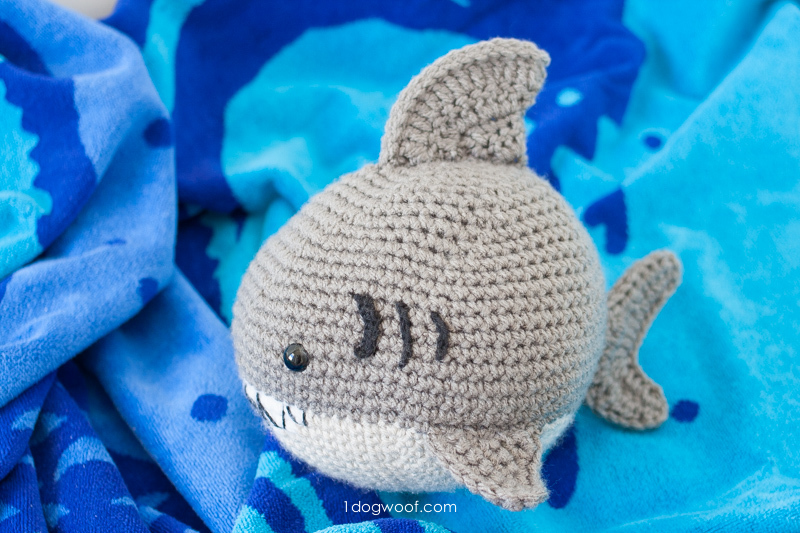 ), and with Shark Week coming up, I thought I’d make a quick crochet shark stuffed animal to share with you all, and of course, for my kids! 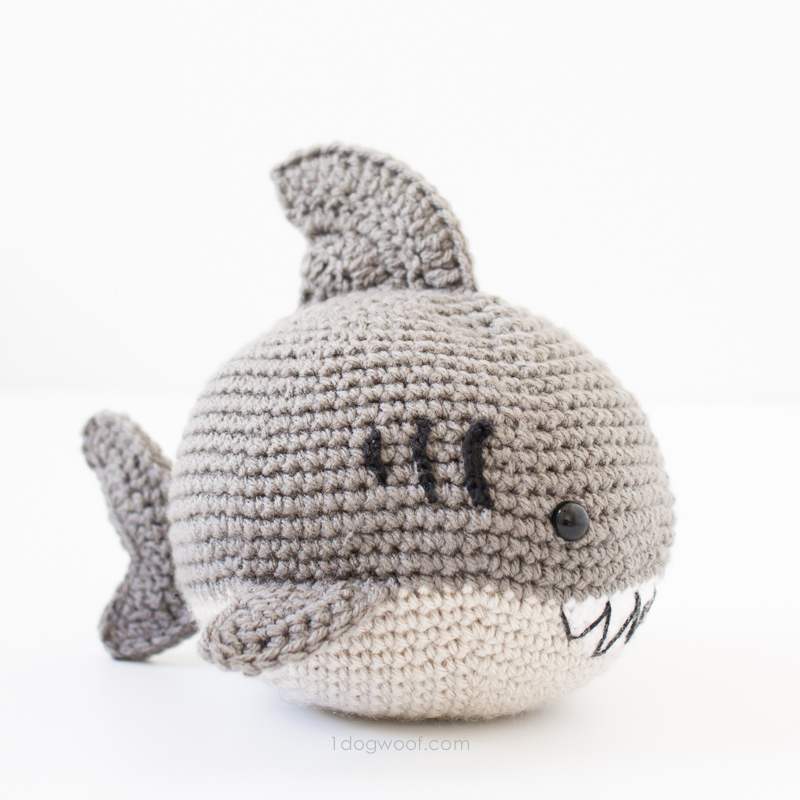 This crochet shark amigurumi is just a ball with fins, so we’ve named him Bernard the Ball Shark, and he works up pretty easily, but as always, the devil is in the details – the gills, teeth, and fins. I’ve tried to take step by step photos when I remember, so hopefully, they will make sense to you. For this toy, I used a dark gray yarn, a light gray yarn and a white yarn. I snagged some Red Heart With Love yarn a Walmart for under a dollar last Thanksgiving, and it’s finally being used! I also used my trusty Lion Brand Vanna’s Choice. I found that the Red Heart yarn was a little thicker than the Lion Brand yarn, even though both are considered worsted weight 4 yarn. The difference in weight didn’t hurt the result at all; actually, it provided a bit of texture difference – I used Red Heart With Love in white for the teeth, and it stood out nicely against the Vanna’s Choice and made it more clear that hey, those are teeth! 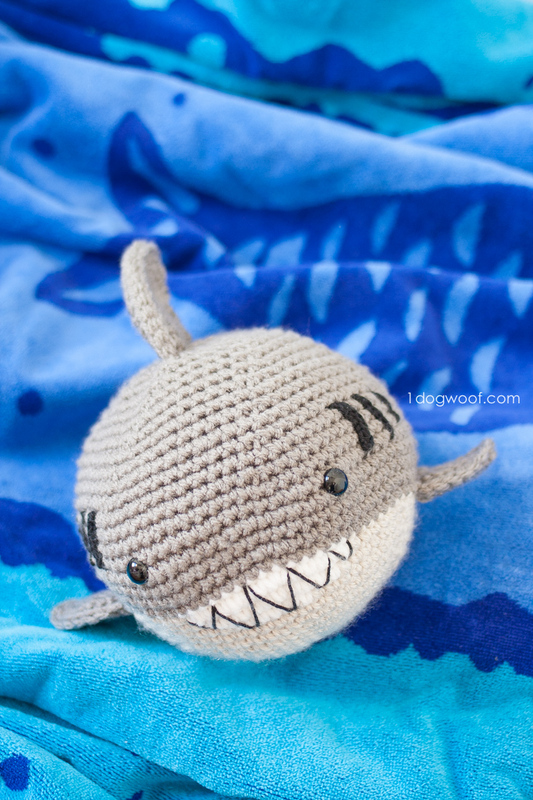 If you’d like to print this pattern, you can purchase an inexpensive, ad-free and comment-free PDF version of Bernard the crochet shark pattern on Craftsy (US only) as well as on Etsy (international buyers, start here!). The file will be available for download immediately after payment. Thank you for helping me continue to provide these fun free patterns! Note: I normally use a size G (4 mm) for stuffed toys, but went up a size due to the thicker Red Heart With Love Yarn. Each color required less than 1 skein. The Pewter was the most used and that was maybe half a skein. I joined my rounds using Planet June’s no-cut join method because I was designing on the fly, so the instructions reflect a joined seam. It’ll work just as well if you work in continuous rounds, it’s up to you. The eyes, gills and teeth embroidery are sewn into the body before it is stuffed and closed up. The fins are added after the body is complete. The positioning of the eyes, gills and teeth embroidery do not have to be exact, especially the gills and teeth marks. I’ve given my best estimate of where everything is attached, but I wouldn’t worry about being completely exact with positioning of all the pieces. LEFT FIN is the shark’s left fin and RIGHT FIN is the shark’s right fin, as if you are the shark. At this point, stop to install the eyes, the gills and the teeth. Also, time to stuff the shark with polyfill! Cut a tail, and pull the yarn through the last loop on hook. Weave the yarn from inside to outside of front loops only of each (6) stitch. Pull tight, fasten off, weave in ends. 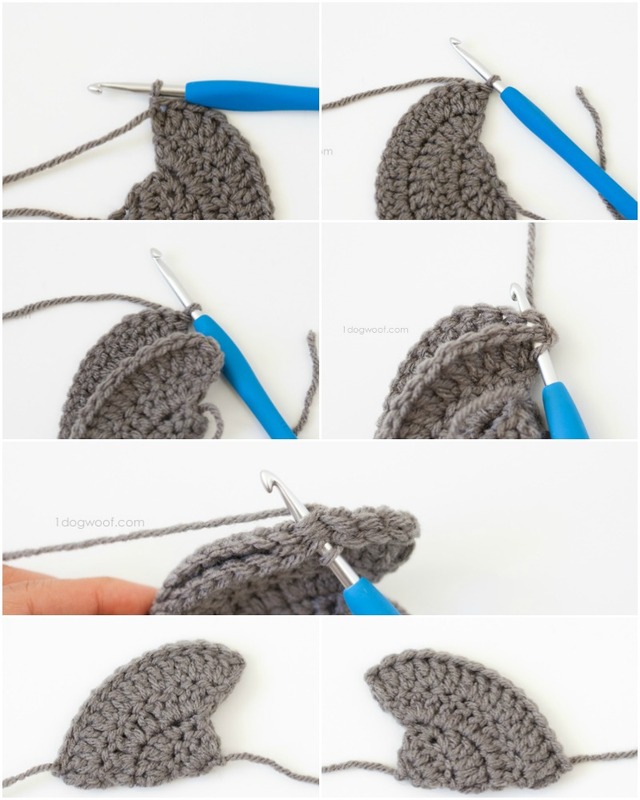 Fold the piece to create a triangle shape – you’ll be crocheting the two sides together. Insert hook into first stitch (there’s no chain stitch made) AND through both loops of the other side, work 1 sc. Working through all 4 loops, continue working 1 sc evenly across two sides of the triangle. Fasten off, leaving a long enough tail to sew onto the body. Weave in the starting tail into the inside of the fin. 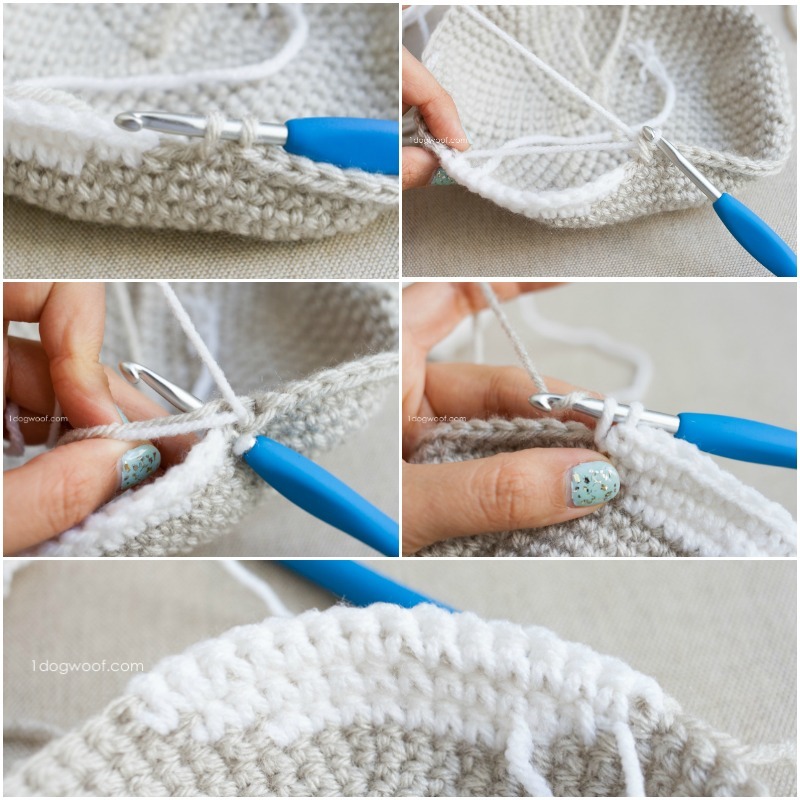 Fold the piece to create a triangle shape – you’ll be crocheting the two sides together. Insert hook into first stitch (there’s no chain stitch made) AND the other side, work 1 sc. Working both sides together, continue working 1 sc evenly across two sides of the triangle. Fasten off, leaving a long enough tail to sew onto the body. Fold the bottom half of the fin up, and using the active yarn, work slip stitches across to join the two halves. Fasten off, leaving a tail to sew onto the body. 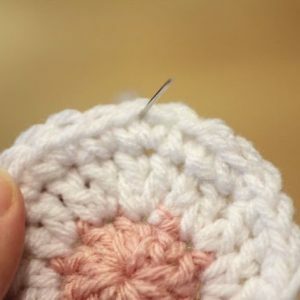 Use the starting tail to sew the two halves of the back of the fin together. 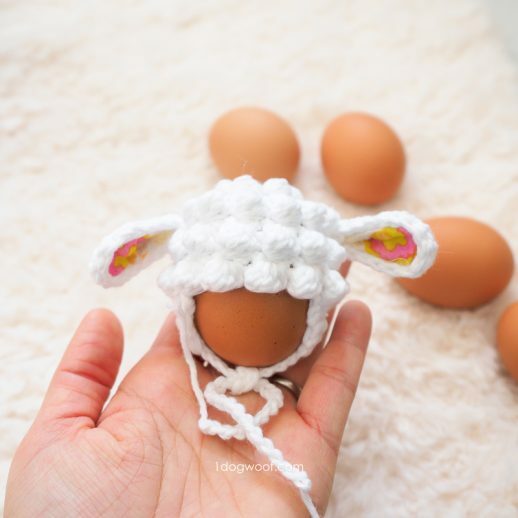 You’ll make 2 tails and crochet them together. For the first one, fasten off both tails and weave in. On the second tail, weave in the starting tail, and use the end tail to crochet the two pieces together. Row 1: Ch 16. Starting from 2nd chain from hook, work 1 sc into each of next 3 ch. Work 1 hdc into each of next 3 ch. Work 1 dc into each of next 3 ch. Work 2 dc in each of next 2 st. Work 1 dc in next stitch, 1 hdc in next stitch, 1 sc in each of next 2 stitches. Ch 1. Turn. Row 2: Work 1 sc in each of next 2 st, 1 hdc in each of next 2 st, 1 dc in next st. Work [1 dc, ch 1, 1 dc] in each of next 2 stitches. Work 1 dc in each of next 2 st, 1 hdc in each of next 3 st, 1 sc in each of next 5 sc. Fasten off. To join the 2 tails together, insert hook through both pieces, and work slip stitches evenly around. Fasten off and weave in ends. You’ll add a new piece of yarn to sew onto the body. Gill #1: Ch 9. Starting from 2nd chain from hook, work 1 sl st into each chain across. Fasten off. Leave tail to sew onto body. Gill #2: Ch 7. Fasten off. Leave tail to sew onto body. Gill #3: Ch 5.Fasten off. Leave tail to sew onto body. The eyes are positioned between rows 18 and 19, at around stitch 33, and around stitch 48. They should line up with the curve of the mouth. The gills are added about 3 stitches behind the eyes, with each gill separated by about 2 stitches apiece, in this order – #1, #2, #3. Use the tail to sew the gills onto the body, using a running stitch, and forcing a slight curve to the gills with the stitches. Zigzag the thin Black yarn over the white stitches to “draw” the teeth. The dorsal fin is attached to the top of the shark’s head, centered. Each side fin is attached to the body where the light gray and dark gray meets (row 22). The front of each fin lines up approximately with the 3rd gill. To join the tail to the body, cut a piece of yarn about a foot long, join it to the tail with a knot around a v-stitch (1 dc, ch 1, 1 dc), leaving enough yarn to sew to the body. The tail joins where the light gray meets the dark gray, aligned with the dorsal fin up top. Make sure all ends are secure and weave in all ends. Whew! This little guy is a great hugger and a great sport – he’s being thrown around the house like a bouncy ball right now. 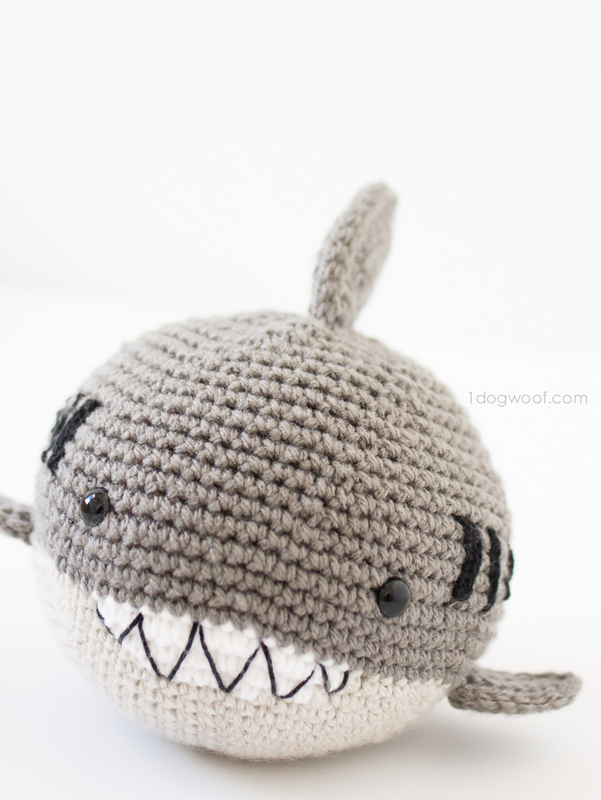 Share your crochet shark creations with me on Facebook and Instagram with #1dogwoof, and happy #SharkWeek! Awesome shark. I like the roundness. Little hands need plenty to grab hold of. Love it! My nephew is autistic and he’s 14 years old. Anyhow he loves anything concerning sharks. I’m going to make this for him. He’s going to love this. Thank you for sharing. 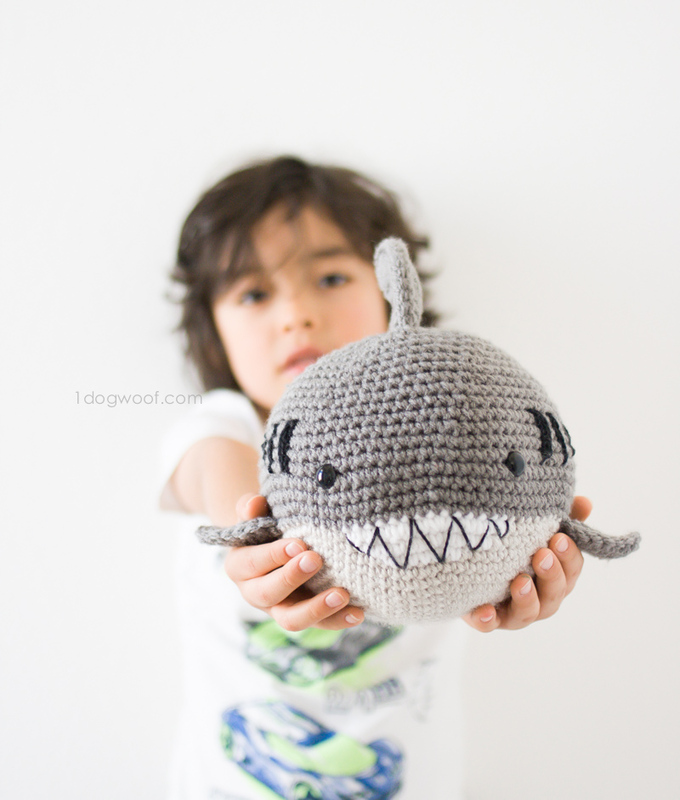 Cute shark pattern and Thank you very much for sharing. But when do you change to the Pewter yarn looking at the pictures it looks like row 16, since 13, 14 and 15 is where you add the white for the teeth. Is this correct? Hi, yes, sorry for leaving out that detail! You switch to the Pewter after row 14. Row 15 is the first Pewter row, with 72 stitches in it. I’ve updated the post. Looks like it should be row 16. As row 14 is the last to ad the white yarn. Looking at the picture, you turn to white again for the bottom of whale, at what time do you change to white? I was looking all over for a dorsal fin shape! 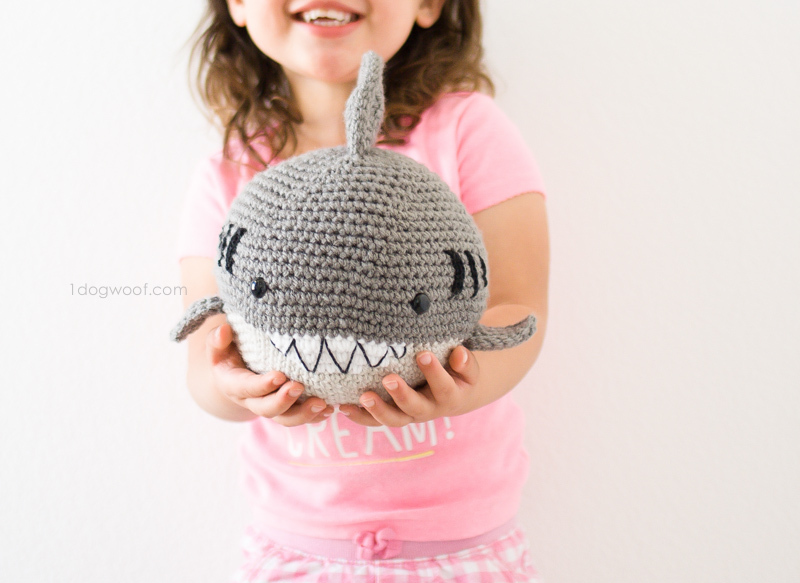 I’m making Baby Shark from a cartoon my grandbaby loves. This is perfect! Thank you! Thank you! Thank you! Haha, glad you like it! Thanks for visiting! Trying this for a gift! 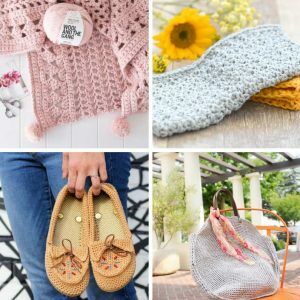 What is your policy on selling items made from your patterns? I would love to sell this and donate part of the profits to Ocean Conservation during the summer months! <3 Im literally #SharkWeek 's number one fan. Hi there! 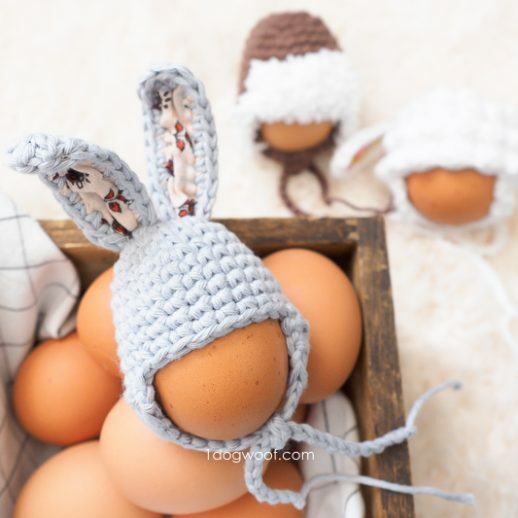 Thanks for this amazing pattern, I would definately make it soon! 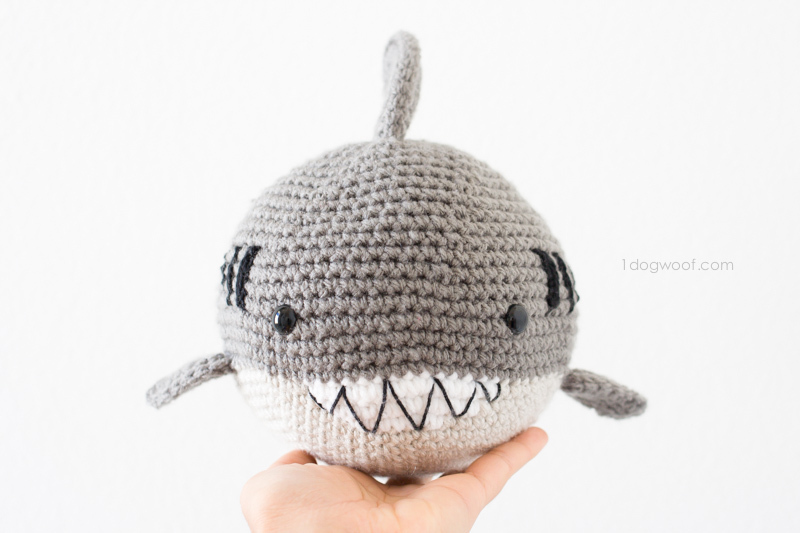 I would just like to ask you something: could you give us approximate dimensions for the finished shark? I’d like to get an idea of how big it’s gonna be. I made this as a Hanukkah gift for my friend who adores sharks. It turned out absolutely adorable and I’m sure he’s going to love it, thank you for posting this! What a lovely shark! Thank you for sharing! Can’t wait to try it. Hi! First of all, thanks for sharing this cute pattern. 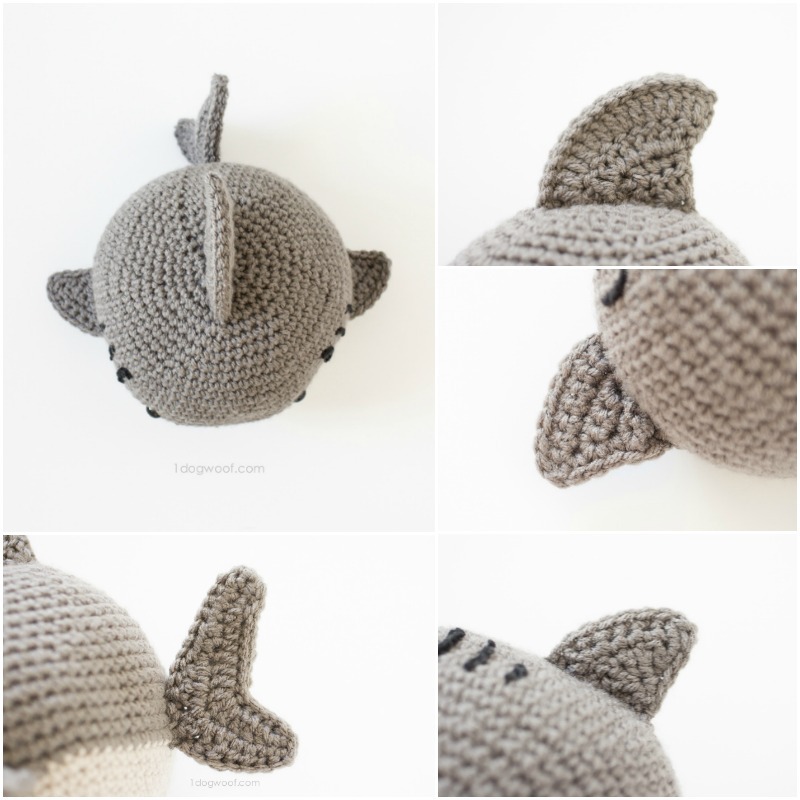 I’m making this for a friend who loves sharks. I’m trying to make this in spiraling rounds instead of joining rounds just like you suggested in the notes because I don’t want a seam. So do I just skip doing the slip stitch and the chain in the instructions and instead just sc in the first stitch to start a new round after final sc in the last round? But will the shape be affected? I guess the final stitch number of each round will also be different from the instructions? 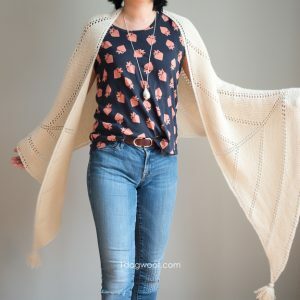 Yes, if you want to work in a seamless spiral, you can skip the slip stitch join. 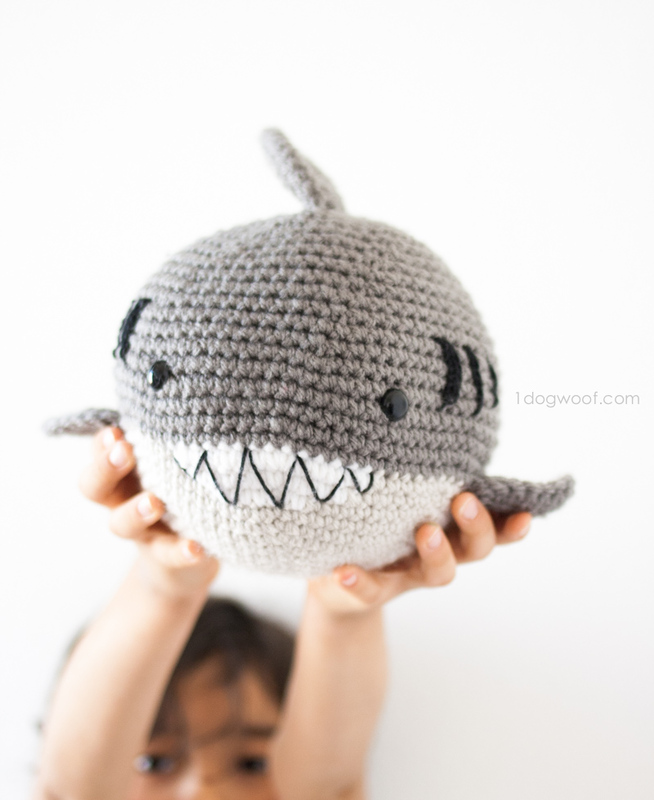 The shark may end of a bit lopsided as happens when you work in a spiral, but the number of stitches in each round should not change. Hope that helps! Love this little guy. 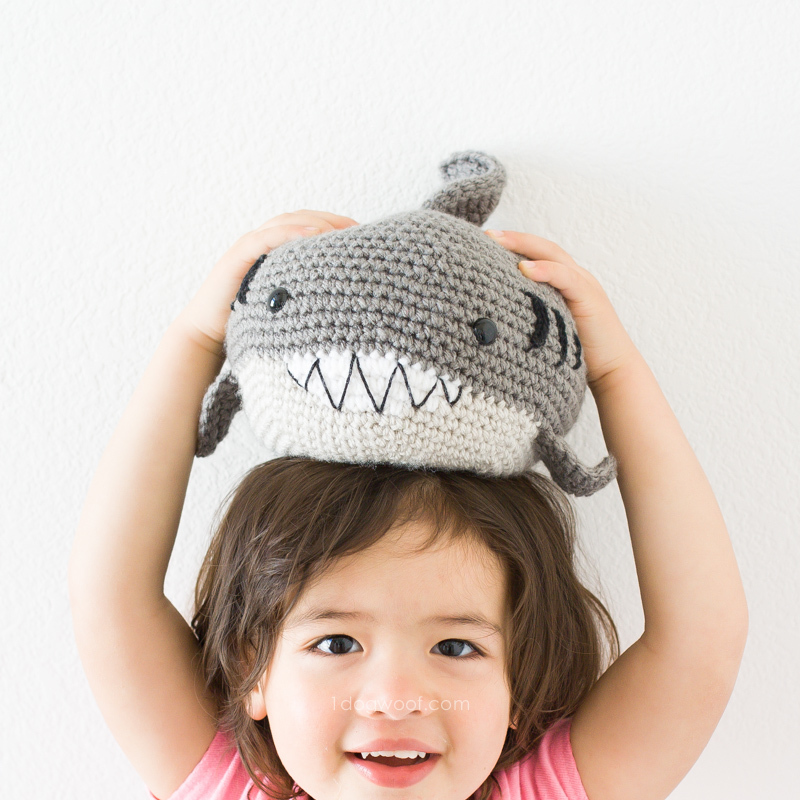 With the “Baby Shark” craze here in CA right now, my two-year-old granddaughter loves him! Thanks for posting this! Hi there thank you so much ! I have question 🙈 .. what is the meaning of ( .2x) ?? Looking for clarification on right fin. Looks like it ends up being a diamond shape where bottom gets folded to top. 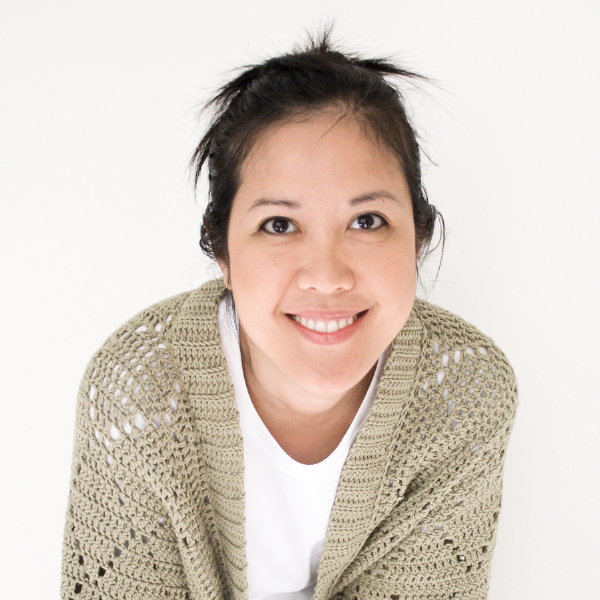 Since you’re at the top now…before seaming sides…you have two open sides with the last single crochet at the top. When you sc down the first side, the next adjacent side is the fold (bottom)…already “solid”. So does this mean you sc around the posts of the stitches across the fold to make it seem a mirror image to the other fin? If so, you might want to annotate for clarity on the pattern. It took me a while to wrap my brain around it. I love it. Thanks for the pattern. I made it for my boy for Christmas. I like taking animal patterns, doubling up the yarn (or using blanket yarn) and then using an L (8.0 mm) hook so I am left with a BIG animal. Worked great for this shark!